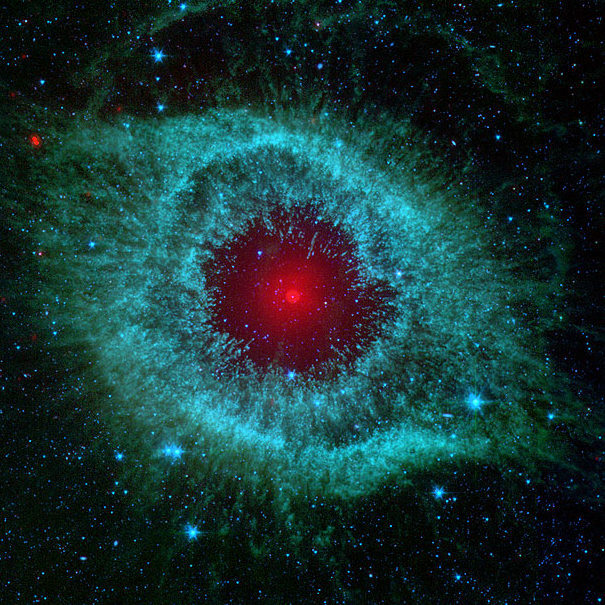 The latest photograph taken by the Spitzer Space Telescope shows a bizarre false colour view of the Helix Nebula. Located around 700 light years from Earth, in the constellation of Aquarius, this beautiful nebula used to be a star similar to our own Sun. As it died, it sloughed off its outer layers, creating the view we see today. It’s a beautiful and haunting photograph, but there’s some important science in there. The dusty dead star at the heart of the nebula is all that remains, but amazingly, its surrounded by dusty disc of icy material. Where’s all this dust coming from? Astronomers think that the death of the star has churned up the region of comets surrounding the star, and we see their collisions. Enjoy the view while you can. Astronomers think that it’ll disappear within 10,000 years or so. The colourful clouds will fade, and all we’ll see is tiny white dwarf ember slowly cooling to the ambient temperature of the Universe. A fate that our Sun will eventually share.